CUSTOMER SERVICE Call 0161 220 1746. Opening Hours Monday to Friday (9.00am to 5.00pm). 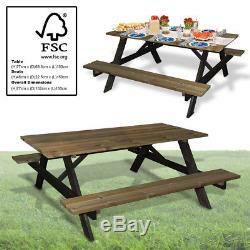 AMBAINCE 5 FEET COMMERCIAL STYLE & QUALITY PICNIC TABLE WITH BLACK LEGS. Adult Outdoor Garden Patio Bench. Hardwood Construction With Simple but strong Assembly. Dimensions - Table; (H)77cm x (D)69.5cm x (L)150cm Seats; (H)46cm x (D)22.5cm x (L)150cm. Overall Dimensions: (H)77cm x (D)152cm x (L)150cm. This Bright Light Coloured Bench Will Make Those Sunny Days Seem Sunnier. The wood is pressure treated to with stand years of British Weather come rain or shine. These Picnic tables feature 6 full size slats on the table and 2 full size slats on the seating. Being of commercial quality our benches are suitable for gardens, pubs, restaurants, schools, playgrounds, Leisure industry etc. Wood from a responsible source. YOU MAY ALSO BE INTERESTED IN. Welcome to Guaranteed4less, a Division of AGP Ltd, a UK based business that has been operating online since 2004. We will only deliver to addresses with a UK Postcode. Once we know you have not received your item we will investigate the matter fully both internally and with our carriers. Unfortunately we cannot investigate non receipt deliveries after this time has elapsed. Investigations into lost parcels can take up to 14 days. Some of the photographs used are library images and we are therefore not responsible for any colour variances or style updates. We guarantee to send you the specification as advertised in the product description. Upon acceptance of the damage, Advanced Global Productions Limited will firstly either (a). Have the item exchanged for same model. You must notify us that you are returning your order as soon as it develops a fault and you will be financially responsible for the return. All replacements are subject to stock availability at the time of processing. The item "Garden Patio Wooden Picnic Table Furniture Heavy Duty Outdoor 5ft Pub Bench Seat" is in sale since Wednesday, March 7, 2018. This item is in the category "Garden & Patio\Garden & Patio Furniture\Garden Chairs, Swings & Benches". The seller is "guaranteed4less" and is located in MANCHESTER. This item can be shipped to United Kingdom.